Today we took a little trip down Independence Blvd/ Hwy 74 to the town of Stallings. This is essentially suburb of Charlotte, even though it is across the county line. Lots of folks have told us about this place, and have suggested we check it out. I can now recommend the same to you. Grand Asia Market caters to the substantial asian population here in Charlotte. For a city that lots of people write off as boring and "whitebread," Charlotte has an incredibly diverse ethnic mix. And if you use your Google-fu and a little bit of gasoline, you can find some incredible little ethnic culinary gems. Today is a perfect example. While I have seen these on Zimmerman's TV show, this is the first time I have seen them here. Aside from this discovery, I can't really say that the grocery side of Grand Asia Market was all that remarkable. The product selection was about the same as some other Asian grocers that are closer to our house. Because we like chicory in our coffee, and don't like what my dad always called "weak Yankee coffee," we buy Cafe Du Monde in the can. Asian grocers typically have it in stock and at far better prices than the anglocentric stores here. So we are familiar with the typical offerings of Asian markets, and Grand Asia Market, while clean and well-lit, was, aside from the abovementioned Balut, about average. On the other hand, what was really cool was their lunch counter and bakery. We had a lunch of dumplings and buns from the bamboo steamers. There is a whole other side that offers the Asian version of a "meat and three" from their steam table. I guess here it is really more of "a rice and three." That's what I'll be having the next time I visit. I really like the idea of lunch counters in supermarkets, especially in the more ethnically oriented ones. 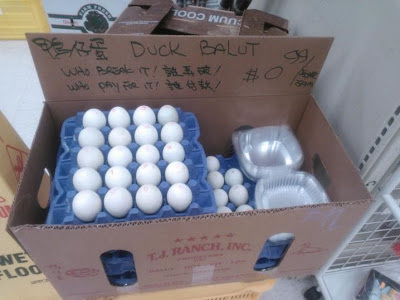 In Charlotte, I think the Asian grocers have the edge on this. PePeRo, a tiny Korean grocery on Monroe Rd had one that I really used to like. It was very basic, I had to order by pointing, and unless one of the kids was doing his homework at a table in the back, there was no English being spoken. It has now transformed into more of a restaurant, and while much more user-friendly, has lost a bit of its charm, its "street cred," if you will. The Super G Mart on Independence has two food outlets in the back, a steam bun place and a Korean restaurant, and is another new favorite. It's the closest thing to a Singaporean Hawker's Market you can find here. Another stall or two, and they'd really be rolling.